Visit to Auckland`s Volvo Ocean Race Village. Miles Seddon (MAPFRE`s onshore navigator), Sally Garrett (Defence Technology Agency), David Johnson (MetOcean Solutions), and Sam Vernon (Crown Infrastructure). In association with Defence Technology Agency, MetOcean Solutions provided high resolution tidal forecasts in the Hauraki Gulf to MAPFRE during the Auckland Stopover of the 2017-18 Volvo Ocean Race. 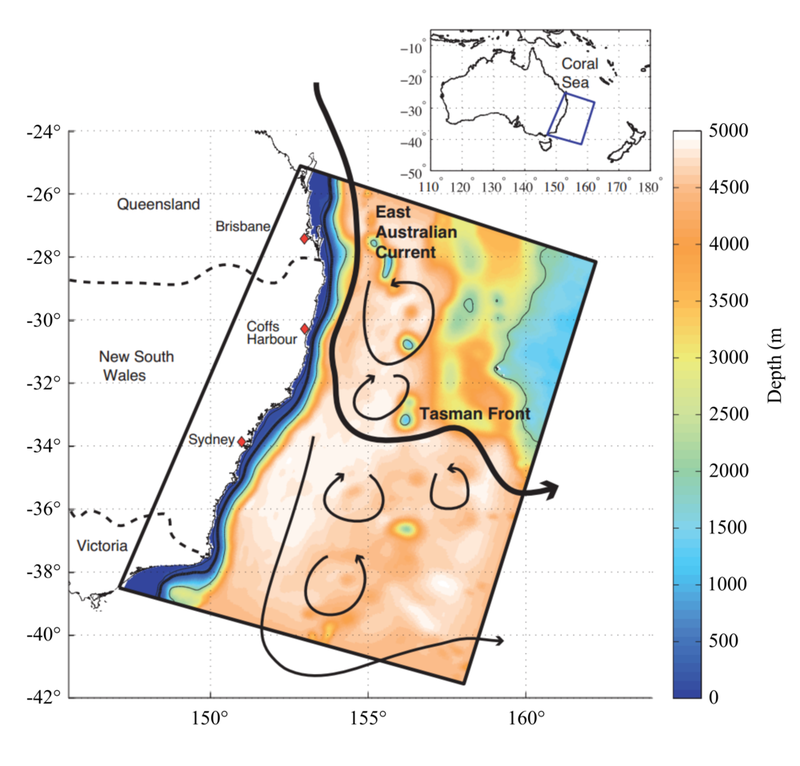 In addition to a tidal prediction model, MetOcean Solutions has also developed a 26-year current hindcast of the Hauraki Gulf, using a 2-dimensional Regional Ocean Modeling System (ROMS) model run at 250m resolution that accurately resolve the tides and water levels inside the Gulf (click here for more information). 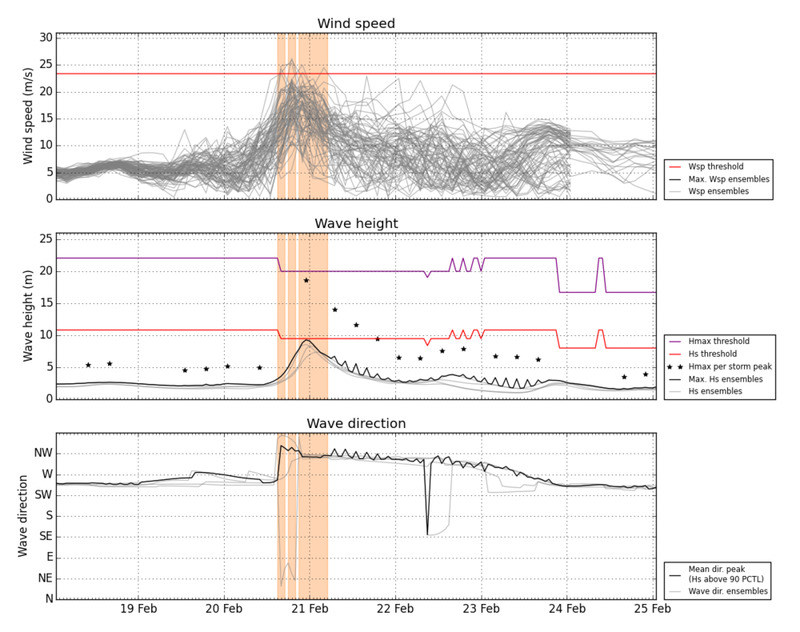 For further information about the Hauraki Gulf hindcasts and tidal models, please contact enquiries@metocean.co.nz. Aitana with the wave drifter buoys on board Tangaroa. On February 9, Dr Aitana Forcén-Vázquez headed to Antarctica aboard the research vessel Tangaroa on a six week science voyage with colleagues from NIWA and the University of Auckland. Aitana’s role as Principal Investigator for Physical Oceanography is to support instrument deployment and data collection, including the deployment of 9 drifting wave buoys for MetOcean Solutions and the New Zealand Defence Technology Agency. Tangaroa leaving Wellington on 9 February 2018. The research project, entitled ‘Taking the pulse of the Ross Sea outflow’ focuses on collecting data to further the understanding of water movement between the shallow shelf and the deeper ocean. How the Ross Sea outflow changes over time is important for our understanding of future Southern Ocean and South Pacific climate. On February 1, Fehi caused storm surges along New Zealand’s west coast, impacting coastal communities in many locations around the country. In Nelson whole streets were flooded in low-lying areas, causing emergency services to evacuate residents. Coastal residents were also evacuated in other areas including Taranaki and West Coast. “Persistent northeast sector winds are forecast to change the sea surface temperatures around New Zealand this coming week,” says MetOcean Solutions senior oceanographer, Dr Rafael Soutelino. “Other places like Bay of Plenty will have slight onshore flows, which will maintain the warm coastal waters,” he adds. The predicted winds and sea surface temperatures (left), and forecast graph (right) show the predicted sea surface temperatures at some coastal locations around New Zealand. The sea surface temperature forecasts are produced by the MetOcean Solutions Regional Ocean Modelling System (ROMS). For more information, contact us at enquiries@metocean.co.nz. The New Zealand government defines open data as data that anyone can use and share - data which have open licences, are openly accessible and are both human- and machine-readable1. Following the example of numerous countries, in August 2017 the New Zealand government adopted the International Open Data Charter, a non-binding agreement mandating that government data are open and accessible to all. The Open Data Charter builds on the New Zealand Declaration on Open and Transparent Government and the Data and Information Management Principles, through which the government has communicated an expectation that agencies proactively release high-value data, and work towards an ‘open by default’ approach2. These policies were adopted based on evidence from overseas that open data enables the development of new knowledge, tools and services, which drive economic development. Since the inception of the term ‘open data’ in 1996, and the concurrent explosion of the internet and the movement towards open source code, the benefits of open data have been assessed by many. The results of the research show that data create more value when they are widely utilised and well-governed. Increased innovation as data become accessible to users from different disciplines. Reduced barriers to entry into markets. Creation of economic value through the development of new products, services or activities. Efficiency gains in the public sector as agencies gain access to data that help streamline operations, and through non-duplication of data collection efforts. Improvement in efficiency and productivity of private businesses using the data. Flow-on effects as emerging second-order users add further economic and social benefits to the economy. Increased government tax revenue through expanded economic activity, as well as higher revenue for individual agencies through the sale of high-value information to companies. Public engagement as the wider population can access educational and cultural knowledge. Improved social welfare as society benefits from transparent and accessible information, stimulating collaboration, participation and social innovation. Greater transparency and accountability of public service providers. Better policy-making based on better data. There are numerous examples of international macroeconomic studies into the economic impact of open government data. A 2014 report3 assessing the value of open data for G20 economies predicted an AU$19 billion return on investment over five years from doubling the accessibility and use of Australian government and research data. Most analyses agree that open data benefits everyone - there are no real losers and widespread wins, because open data makes better use of existing resources. Consumers and the broader society stands to win the most, although there are some benefits to data providers. A European Union study4 concluded that releasing public sector information leads to modest direct revenues to governments. It estimated that most European nations would see a gain of 1% of agency budget, but that gains of up to 25% were possible. These estimates were based on the Netherlands and the UK, who both gather revenue from opening up government data. However, all studies agree that that open data creates new types of businesses, providing opportunities for small and medium enterprises and business models like advertiser-pays rather than end-user-pays5. Of all the different types of public sector data, weather data have been identified as particularly important because everyone - including individuals, private companies, local and national government departments - can all benefit from it. Applications that make use of open weather data can therefore potentially have a huge impact. Several studies have attempted to place a value on open weather data. Research from 20096 indicated that US adults used more than 300 billion forecasts per year at the time, which was valued (by the general public) at $286 per household per year, providing an aggregate annual valuation of weather forecasts of about US$31.5 billion. At the time, government and private sectors spent US$5.1 billion on meteorological operations, research and forecasting, which means that the value provided by weather forecasts was 6.2 times higher than the cost of producing them. Open weather data in New Zealand? This is a really good question for New Zealand to ponder during 2018. We have a small economy with a big ocean to manage and we tend to get a lot of weather! There are two state-funded organisations independently collecting data and independently producing high quality national weather forecasts, plus a range of international weather forecast providers with various types and qualities of data available. So, what is our current source of weather truth? Is there a better way for the needs of the New Zealand economy and general public to be served? To answer that question in a meaningful way, it’s helpful to consider where exactly data comes into the equation. The value ladder for society starts with data. We need open data so that all sectors of the economy can contribute to the generation of information and knowledge, so ultimately we can collectively and consistently make wise decisions. Traditionally, the creation of weather knowledge has required human intervention, with trained forecasters interacting with data to produce guidance. As numerical weather models become better and more detailed weather measurements become available, the ability for models to accurately quantify and predict the weather will continue to improve. Weather on planet earth is still a chaotic process, however combining computer weather models with machine learning and other such techniques will allow us to become more quantitative when describing the present and future weather states. And quantitative data is exactly what modern infrastructure demands. Think automated smart irrigation systems, traffic management algorithms and transport logistics networks to name just a few. All require weather data in the raw form to ingest and create information and knowledge specific to those applications. The global market for this is enormous, which is why private sector worldwide has invested so heavily in weather prediction and a whole new generation of sensing technologies. Within a few years the capability of private weather services will likely exceed that of most national weather agencies. Couple that with the disruption from constellations of small low cost weather satellites, and we have the imminent arrival of a new world order in weather forecasting. So, back to data. New Zealand doesn’t have a great track record when it comes to making public funded environmental data openly available - but it's true we are making steady progress (see here). At the same time, the quantitative demands of the modern world are resulting in a flood of high quality private data becoming available and strong consumer options regarding alternative weather sources. In order to remain relevant, it might be timely for New Zealand to clearly define the national weather ‘sources of truth’, and perhaps actively push data into the economy to gain the universally benefit from the wealth multipliers that arise when enterprise creates knowledge from data. Note - these are views of the authors, and do not represent MetOcean Solutions or MetService. Lazo, J.K., Morss, R.E., and J.L. Demuth (2009) 300 Billion Served: Sources, Perceptions, Uses, and Values of Weather Forecasts. Bulletin of the American Meteorological Society. 90(6). The drifting Southern Ocean Wave Buoy is going round in circles deep in the Southern Ocean, temporarily slowing down its steady passage east across the southern margin of the Pacific. The buoy is caught in an eddy, a circular movement of water created when a bend in a surface ocean current pinches off to make a loop, which separates from the main current. The buoy, which has been drifting with the ocean currents since it left its moored location on 28 July, was deployed south of Campbell Island in February 2017. Part of a collaborative research project involving the Defence Technology Agency and MetOcean Solutions, the buoy has been transmitting wave spectra data via a satellite link, providing vital information which will help the New Zealand Defence Force to design patrol ships suited to the rough seas of the Southern Ocean. In the two and a half months since its escape, the buoy has drifted some 450 nautical miles east-northeast. In late September, the buoy passed within 20 nautical miles of the remote uninhabited Antipodes Island group. Senior Oceanographer Dr Peter McComb is happy that data is still being transmitted. "The buoy is solar powered, and we were expecting the batteries to run out during the subantarctic winter. However, it is still happily sending wave spectra data from its path drifting slowly eastwards along the southern margin of the Pacific Ocean. So far, it has encountered moderately rough seas, with significant wave heights of up to 9 m and maximum wave heights of 15 m.
In May 2017 the buoy made headlines when it measured a monster 19.4 m wave from the moored location near Campbell Island. Prof Moninya Roughan sharing her ocean observation expertise. This week, Prof Roughan is teaching at the GODAE Ocean View Summer School in Mallorca, Spain. GODAE is the Global Ocean Data Assimilation Experiment, an international initiative started in 1997 aiming to establish infrastructure for global operational oceanography. Prof Roughan is part of a team of world-leading oceanographers brought together in the summer school to teach the next generation of leading oceanographers, some 70 students from around the world. Prof Roughan is giving two lectures on ocean observing, covering global and coastal in situ observations. New Zealand aims to be a GODAE contributor within 1-2 years with the operational development of the Moana Project modelling hindcast / forecast suite, which will be greatly facilitated by MetOcean Solutions' new role as New Zealand's operational oceanography provider. Operational oceanography is an integrated approach using a variety of methods (including satellite observations, in situ monitoring, and modelling), science-based and user-driven to describe and forecast the ocean to support societal needs. The participants of the GODAE Ocean View Summer School.